Not many independent animation studios have a large staffs; fewer still are a one-person operation. But such is the case with Zandoria Studios — also known as animator William Sutton, working out of his home in Tennessee. While still working a day job, Mr. Sutton has found time to create CGI sequences for various independent films. Meanwhile, he’s been working on his own personal project: TAR of Zandoria, created using the popular Animation Master software. TAR, you see, is a barbarian hippopotamus, who spends his time wandering the wasteland in search of adventure, dancing girls, and fruit punch — but who must instead busy himself dispatching armies of hyenas and other evil-doers. A Kickstarter campaign to finance the first episode of TAR was unfortunately not successful, and so Mr. Sutton is seeking out other ways to bring his idea to life — and the screen. Check out the official TAR web site to find out the latest and see lots of background sketches — both computer-generated and traditional art. Orangina, the carbonated citrus drink whose advertisements have featured anthropomorphic animals since 2007, has released two new commercials. Created by the Fred & Farid agency, the commercials are for "Miss O", the sugar-free version of Orangina. With the tagline "Who’s Boss? ", the advertisements take stereotypical gender roles in relationships, and reverse them. In one promo, a hyena businesswoman phones home to her human boyfriend or husband, and proceeds to lie about working late so she can have a night out with her friends. In the other, a black wolf in a cafe gives a "It’s not you - it’s me" speech to her human boyfriend, who doesn't take the breakup very well. Well now, this seems to have come out of nowhere: Carnal, Volume 1: Pride of the Lions, written by Jason Bergenstock and illustrated by John Connell. Here’s the description from an article by Mother/Writer/Gamer: “The first graphic novel in the Carnal series, Pride of the Lions takes place on the continent of New Africa and focuses on three main species of humanistic animals. After the Great War decades earlier between the hyenas and the lions, the victorious and once united lion prides now lay scattered across the land, torn by civil unrest over territory disputes and food shortages. The hyena clans that survived the war were forced deep into the Earth and now live in a massive underground city under the control of a terrible witch. The buffalo race is indifferent to most other species and have walled themselves off from the rest of the kingdoms. Humans have lost their hold on the African territories long ago and live as a simple, nomadic species. The first book opens with Long Eyes, an old sapphire-eyed lion who is determined to save the lion kingdom and rescue his warrior son, Oron, who has gone missing. Long Eyes believes Oron is the key to uniting the prides. 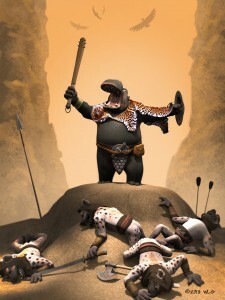 After the recent review of the terrible Hyenas, here's something to make hyena fans happier! 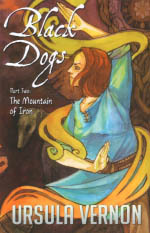 When Ursula Vernon published the first volume of Black Dogs in 2007, her life was very busy. She was moving house, her webcomic Digger was experiencing a surge in popularity, and her newly-acquired literary agent had got her a sweet deal to write and illustrate children's books for Scholastic. 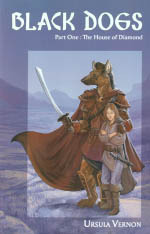 Understandably, writing a sequel took a back seat, so when the second half of Black Dogs was published four years later, Sofawolf Press conveniently reprinted the first volume with a new cover. Black Dogs is a fantasy novel set in a world with humans, elves, and many anthropomorphic species. The main character is Lyra, a young human who finds herself on the run after her merchant family's home is attacked by bandits. Though educated and well-read, she hasn't much practical knowledge. 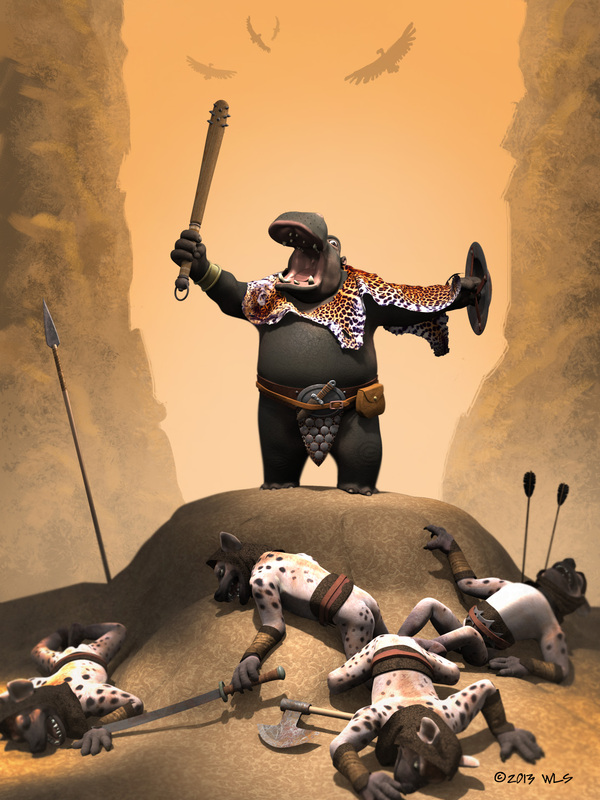 Luckily she meets Sadrao, a tall, kind dog-soldier, one of a respected species of anthro-hyenas. Taking her under his wing, she joins him on his travels while he teaches her survival skills. 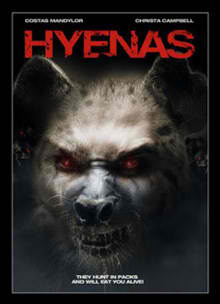 The pitch for Eric Weston's Hyenas must have resembled "it's a werewolf movie, only this time they're werehyenas!" On one hand, not exactly the greatest movie premise ever. On the other hand, it worked on me. Right here it should be said Hyenas is a bad movie. Besides the obvious reasons a low budget, straight-to-DVD creature feature might not be worth your time, it manages to offend in ways it didn't mean to. So here's fair warning for any other furry hyena fans hoping for at least a glimmer of decency: look elsewhere. Jennifer Smith and Dr. Kay Holekamp of Michigan State bring us cute photos of hyena cubs. 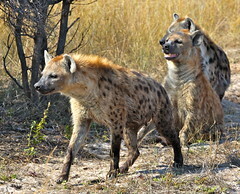 Their research (click names) on the social behavior of the Spotted Hyena is worth reading.